The natural prism to view any Lions’ selection is through green/red/rose/thistle tinted glasses. While the Mole can’t see the logic in omitting Sean O’Brien, who covers every position in the back row, in favour of Dan Lydiate who does one thing extremely well in one position it doesn’t come as a great surprise. Warren Gatland is still the Welsh coach, on secondment from the WRU, and will return to that post when the tour is over. Managing those conflicts of interest can’t be easy. The outcome of the test series will be the judge of Warburton’s captaincy. His appointment was not greeted with unanimous praise, even within the Principality, and his form over the last two seasons has varied greatly. Cardiff have not been competitive at the top level during his time at the club and many of their big names do not perform near the peak of their abilities. However, if the Lions win then he will be attributed with something intangible and a nice way with referees. The man that the Mole feels for most as far as selection goes is the youngest member of the squad, Stuart Hogg. Gatland’s decision to name only two outhalfs was questioned from the day the touring party was announced with many presuming that the decision was made in order to leave room for Jonny Wilkinson to join when Toulon’s season was over. As it turns out, Wilko never arrived and Hogg has started two games at full back and two games at out half. There’s been a spate of injuries to the Lions’ backs including a worrying number of hamstring strains. Despite this Hogg won’t be involved in the First Test with Farrell and Maitland covering the backline. Cuthbert’s defending has given rise to concerns and I’d have liked to see Hogg tried on the wing during the tour. Hogg scorched Munster for a hat-trick from second centre in Musgrave at the tail end of the 2012 season but has never started at fly-half for Glasgow. His versatility out wide and his ability as a strike runner would seem ideal for the bench spot while his confidence can’t have been helped being asked to play outhalf inside a cobbled together backline against the Brumbies. I considered Rob Kearney fortunate to be selected given that he did not seem to have recaptured anything near the form he displayed prior to his back surgery that made him European Player of the Year in 2012. Three full backs seemed unnecessary and as events transpired Kearney has been a peripheral player on tour due to injury. If you wanted someone who could play both full back and outhalf then the two candidates that spring to mind are James Hook and Ian Madigan. Alternatively, Greig Laidlaw’s versatility might also have stood to him on this tour. It looks to the Mole that Gatland’s preference for a backline full of giants and Leigh Halfpenny impacted upon squad selection. Hook is listed as 1.83m and 93kg while Mads measures 1.80m and 91kg. Laidlaw probably does not appear on Gatland’s radar, as he is 1.76m and 80kg. Hook’s last start for Wales was in the 2011 RWC semi-final when he played flyhalf and was substituted for Stephen Jones. Whatever he did, Gatland has not forgiven him as he hasn’t started a game for Wales since that (bar vs the Barbarians) while Madigan’s international career fell victim to Kidney’s selection folly. Hogg is listed at 1.83m and 84kg on the Glasgow Warriors website but is a powerful runner with the ability to break tackles and turn quickly who can kick the ball a mile. Instead Gatland has chosen to go with Cuthbert (1.98m, 103kg) in the test match and more than likely would have started Jamie Roberts ahead of the on-form JJV Davies were the doctor not injured. What was Gatland thinking when he selected Hogg for the squad? Did he view him as a contender for a test berth at full back or was he selected there in case of injury to Leigh Halfpenny? RWC11 has defined Gatland’s selection policy with regards to more players than Hook. Leigh Halfpenny had only ever started as a wing before the quarter final against Ireland which was the first time he wore 15 for Wales. Since then he has been a regular and his outstanding form on tour merely takes up where he left off during the Six Nations. Gatland’s contention that he didn’t want his outhalves “undercooked” makes his selection of Hogg against the Brumbies seem strange. Is he planning to take Sexton off the pitch and finish games with Farrell? As it is, Farrell has started one game in Australia and that may be his Lions career. Was Hogg picked in order to sit on the bench for tests alongside Farrell but with the ability to come on at fly-half and present Australia with a different sort of test in defence? That seems highly unlikely. Farrell’s situation calls the idea of a “tour” into question. In spite of all the injuries, very few players have gone home and those called up haven’t replaced anybody, they’ve just got the clobber and added to the Woodwardian throng. If Farrell wasn’t required for the starting team against the Brumbies then why not bring a third outhalf or true “utility” player on tour from the outset? Both Hogg and Zebo, surplus to requirements to the 23 for the first test, could have started on the wings with Farrell at ten giving everyone a better chance of making a late challenge for a test spot and keeping the Lions’ winning record intact. In 1993, Wade Dooley left the tour because his dad died. Martin Johnson was called from Canada to replace him and the Home Unions wouldn’t let Dooley rejoin the tour, despite the Kiwis being OK with it, because the tour agreement limited the Lions squad to 30 players! How things have changed! I don’t think Hogg would have been used in the same way on tour were he a Welsh player and the thinking around Hogg’s selection seem very uncertain. Was one of the best back three runners in British rugby selected as third choice outhalf? Why didn’t the Lions try one of their most potent runners and a proven try scorer on the wing when they’ve had high profile injury problems in that position? Is a back three with Hogg and Halfpenny too small for Warren Gatland? It seems to the Mole that the answer is the dog that isn’t barking. As mentioned above, many expected Jonny Wilkinson to be announced as a tourist once his Toulon season was over. Wilkinson politely declined Gatland’s overtures without ruling himself out but it seems Gats didn’t take the hint. Did a content and experienced Wilko look at the prospect of returning to Sydney ten years later amid a media circus and think to himself “Too much”? Or did he feel a sense of loyalty to Toulon and wish to return fit to defend their titles after getting his groin operation? It might be that his long shadow has obscured Stuart Hogg’s fire on the 2013 tour. This entry was posted in Lions and tagged divided loyalties, Jonny Wilkinson, mind the cuddly toy, Stuart Hogg by dementedmole. Bookmark the permalink. Great to have you back, Boss. Never saw that angle – that he’s filling an embarrassing Wilko-shaped hole. Great stuff Mole. Like the old 47a. Three at once! Gatland was only ever interested in the test matches and his squad selection reflected that. 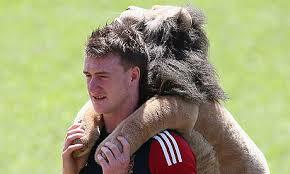 If there was another 10 he could have trusted in a Lions test match, he would have picked him. But he doesn’t trust Hook (too flaky), Laidlaw (too small) or Biggar (?) and Priestland is injured. Madigan would have been a bolter, and Gatland doesn’t do bolters, it seems. Hogg has been the unfortunate beneficiary of this policy, togging out at 10 in what are essentially meaningless games to the test-match-fixated Gatland. Presumably he put himself out of contention for the 15 jersey in the Reds match, and that was the end of that. For the sake of the tour as a whole, it would have been far better to have had some flexible players in the OH and centre positions, and his failure to select Hook (cover for 10, 12, 13 and 15) is especially baffling, but Gatland doesn’t seem to care about the tour. And I suppose he’s probably right. People only remember the midweek failures if the test matches are lost. No-one cares that the midweek Lions went unbeaten in 2005, for example. I’m not sure about not picking bolters, Priestland earned his first two starts in warm-up games before going to RWC11 as starting 10 ahead of Stephen Jones and James Hook. And he cleaned house with Ireland back in the day when introducing O’Gara, Stringer, Easterby, Hayes and Horgan. Based on those selections I thought he’d have a few more left field picks in the squad. He’s defo going out to win the test series alright and I think Hogg might have been a game breaker in the series but he’s not had much chance to shine. We’ve been thinking the very same thing – Hogg has not really had a chance to show what he can do, and has a right to be pretty frustrated. He went out as a 15 who can cover 10, and has ended up doing pretty much the opposite. Hawick under-20s have never been considered good preparation for the Lions and this is maybe why. We are all perhaps fortunate that there aren’t many Scots on tour – in 1983 the Scots (Deans, Beattie, Calder) pretty much splintered from the rest of the squad in the fallout from Fitzgerald being captain and keeping Deans out of the team, despite Jim Telfer’s preferences. If key players get p-ed off, the tourwon’t be fun for anyone. Do you think this is looking more like 2005 than 2009 at this juncture? At this stage it still looks kinda 2009 and the mood in the camp seems pretty good. I remember watching the doco about 2001 and the midweek team went off to the set of Neighbours for the day. They all looked miserable. Someone tried to get the theme tune going on the bus but it was a total effort! Who says Australia is devoid of culture?! I don’t think the lads are away long enough to splinter and improved communications means they’re closer to home than in the past. The success of the tour will be judged on the test matches and there’s not a huge amount of room for error. It’s more likely that if they fail to win the series it’s because there either wasn’t enough time for units to gel or players weren’t in form but were picked anyway. The latter can be difficult to explain but if Heaslip, for example, repeats his first 60 minutes against the Waratahs then he’ll be blessed to start the following week. I think Roberts’ injury might be a blessing in disguise because Davies has been on fire while the Doc has struggled for form all season. Of course, a dodgy performance could be experienced by anybody. Except Drico. First off, it’s marvelous to have you back Mole, and three articles in one week… each a gem. Even through green-tinted glasses it’s hard not to feel for Hogg, who definitely has that X-factor from fullback. Unfortunately for him, there are a few places on this tour where unless the incumbent played himself out of it you’re wasting your time, and fullback was one of those. I’d still have him on the bench ahead of Maitland, still solving any “power of four tokenism (copyright WOC). I’ve no problem with not bringing Wilko, who is not a running threat, but would still have brought Hook/Madigan, plus a bit of grunt like Sheridan and Hines (can’t imagine the loss to Brumbies with big Ted and Hinesy fronting up). Not quite the shambles that was 2005, but looking at the lack of motivation that a lot of the dirt trackers showed on Tuesday, maybe a bit more like 2001, complete with kiwi Welsh coach. 2-1 Wallaby series win and Gatland to take over the ABs following the 2015 RWC? Before the tour even started there was a fair amount of praise for gatland as a strong non-emotional selector but picking hogg as a back up 10 exposed a certain limitation in that impression of the man. That has been backed up by lydiate on the bench. There was no need to bring another 10 that could start a test match, but there was a need for another ten. I feel for hogg, he’s probably too young to know any better, I hope this doesn’t damage his confidence next season. I said at the start that the only thing that could beat the Lions this tour is Gatland himself. I was never sold on him as a great coach and even less sold on him as a Lions coach. Success does not necessarily mean you are a good coach. Crazy Pete anyone? I’m sure he’s fantastic behind the scenes but he is playing favorites and its going to cost us. I don’t even think his original squad was any good, ignoring that it was a bit small. I wondered how S.Armitage and especially Hines were overlooked (Top14 argument not withstanding) and players like Maitland/Dan Ludite made it in. I desperately feel for Hogg, I would take him over a hundred Kearney’s any day (And I am a Leinster man) but Mole you have hit the nail on the head: Hes too small to fit into Gatlands monster selection and hes filling the gap Mr Wilkinson has chosen not to fill.